Through our personal interview process, we asked a number of questions to assess Ben’s readiness to spend time away from home. We started the process early, so Janice and her husband Craig would have a chance to visit several camps with their son. 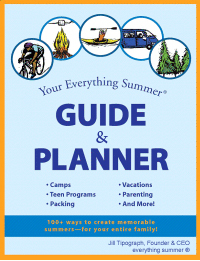 We extensively researched a number of possibilities, and of those recommended a short list of camps that offered activities that Ben liked, were consistent with his parents’ child-raising philosophy, and were geared toward handling first time campers. Everything Summer® reviewed the merits of each camp with the family, ensured space was available, and helped plan visits. Ben and his parents toured three camps while they were in session, to help them decide for the following summer. We gave them a list of Camp Director questions to ask and several fun places to visit en route to the camps so Ben and his younger sister wouldn’t get bored. We provided Janice and Craig with insights from other families who had sent their children to the camps they were considering and assisted them in making the right decision. Ben loved his first summer at overnight camp. He made new friends, tried a variety of new activities and became much more independent. Years have passed, and Ben has graduated from camp and is now in college - but his closest friends are still the camp friends he made that first summer.